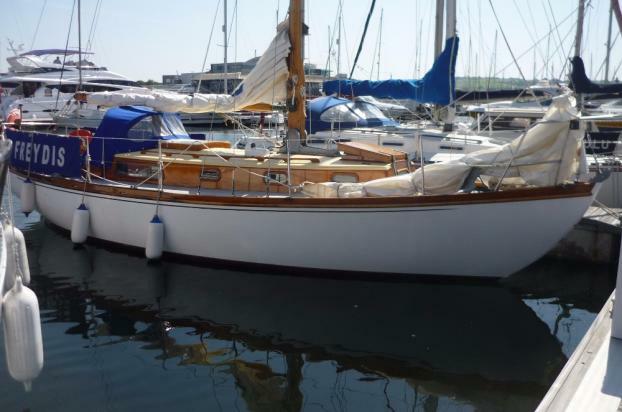 An attractive classic yacht designed by Alan Buchanan. The Viking Class design dates from the 1950’s and was built by a number of different yards. Over the years the designer modified and improved the overall lines to provide a good cruising yacht that also rated well under the RORC rule - the Viking Class has an excellent record for racing, winning many off-shore events during the 1960’s & 1970’s. This example was built by William Wyatt, West Mersea in 1964/65. Under present ownership for over eight years, extensively refitted in 2010/11, and again in 2015. Heads compartment with sea toilet and pull-out sink, pressurised water system. Bermudan sloop with varnished spruce deck stepped mast in a galvanised tabernacle. Constructed by William Wyatt, West Mersea. Long keel with iron ballast, transom hung rudder. Under current ownership for five years. Hull stripped and repainted above and below waterline in 2011, repainted in 2015.